I used a special sugar I have from a friend, a "seasoned sugar". 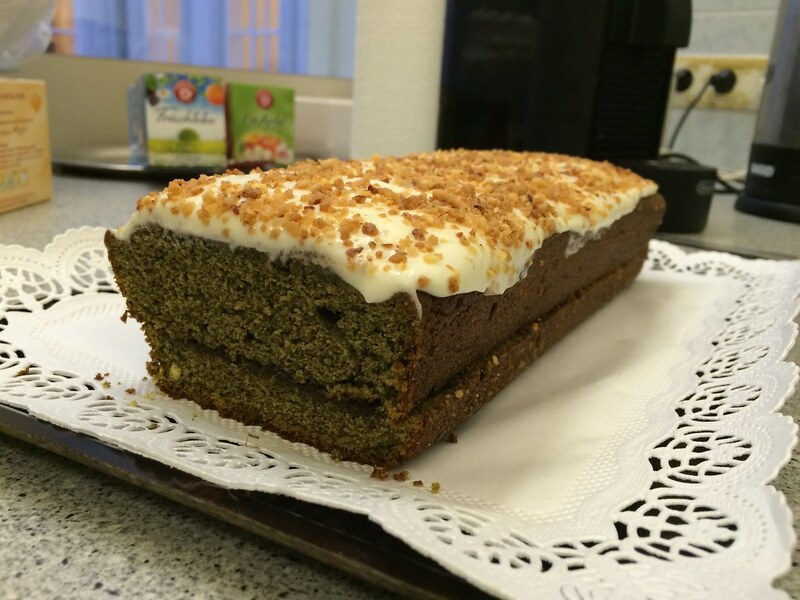 What I did not think about was, that the spice-mix included also rosemary and mint, what was not too bad for the cake but for sure dominated the vanilla... and made the cake green. Funnily, I did not even think about that as a possibility until I mixed the sugar into the butter. Big surprise, haha! 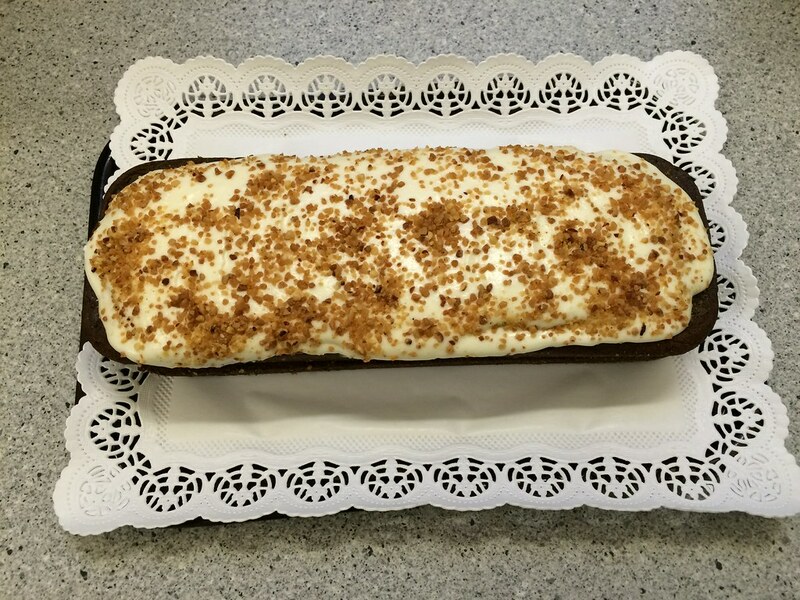 As the cake was not quite like the recipe wanted it to be anyways, I decided to top the cake with a creamcheese frosting (from Dorie Greenspans "Big Bill's Carrot Cake" from Baking, from my home to yours). To avoid the cake to loose its flufiness, I split the cake and added some Black Butter, a speciality from Jersey/Channel Islands - a spread made from apple cider, licquorice and spices. That worked very well with the spices from the sugar! 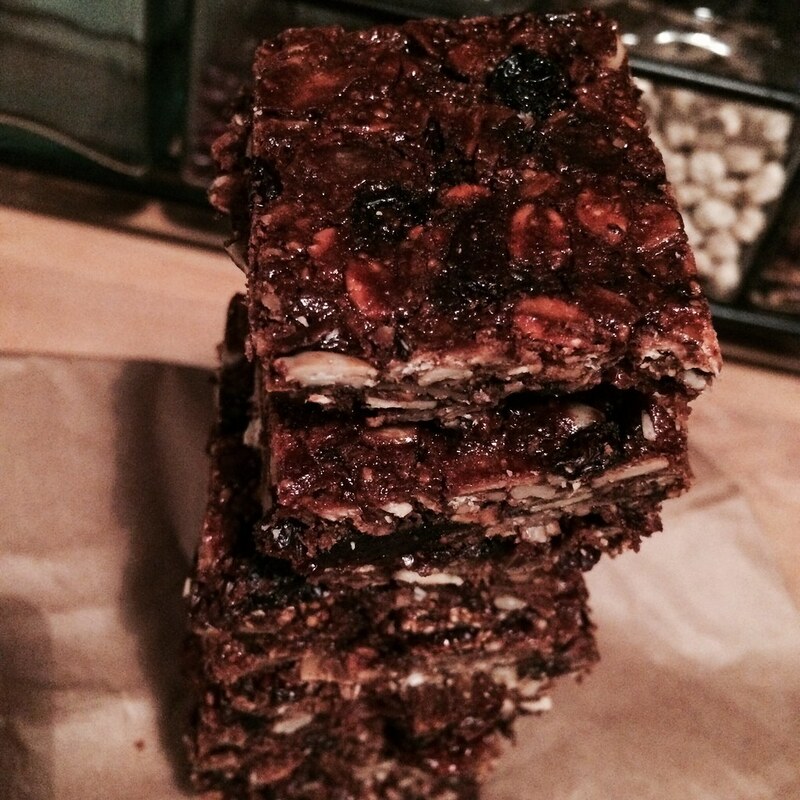 What I made some way back are the Granola Energy Bars (Baking Chez Moi, p. 328). I had to use maple syrup and gold syrup so they went dark brown, but the taste was good and I think only the looks differ from the recipe. 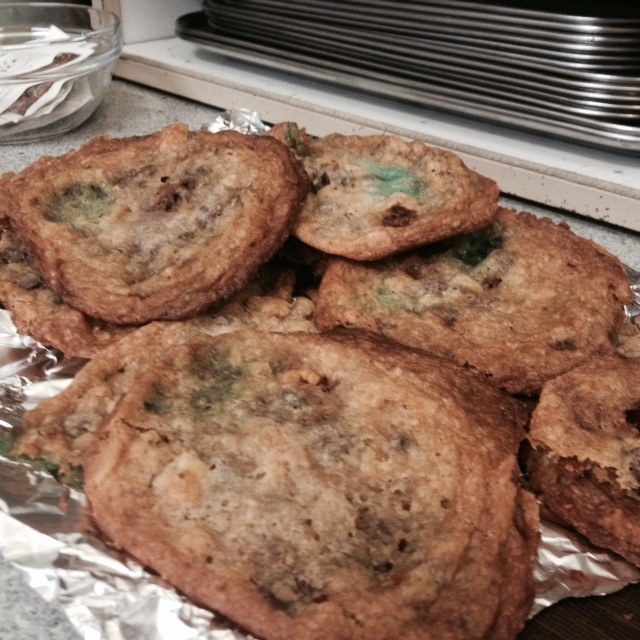 Then I made back in December the annual Amnesty Cookies, As usual, they turned out great in taste, as usual, they turned out ugly in looks. But why change a winning team ;-) The recipe can be found at David Lebovitz' page. And I made "Rugelachs that won over France" (recipe on p. 301 in Baking chez Moi). For the Rugelachs I have to say, that they turned out really really ugly. I don't know why exactly. Rugelachs are a bit finickey to make, but I made them several times, with different recepies from the other TWD-books, and they turned out better. 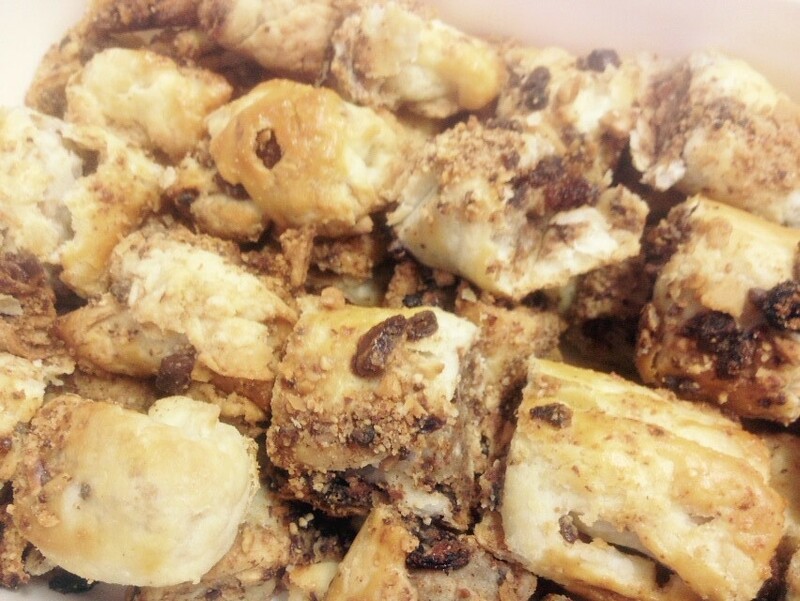 But in the end Rugelachs are always great, whatever they look like. This is one of the treats I am happy to got to know trough TWD because in Vienna I never saw Rugelachs before. As I go on writing I see that I actually made a lot the last weeks... I really forgot about it! How good to catch up! One of my colleagues leaves us and heads over to Paris to start a great job there. She is goint to spend t least two years there with her partner and their adopted child. I am a bit jealous but most of all very happy for them! 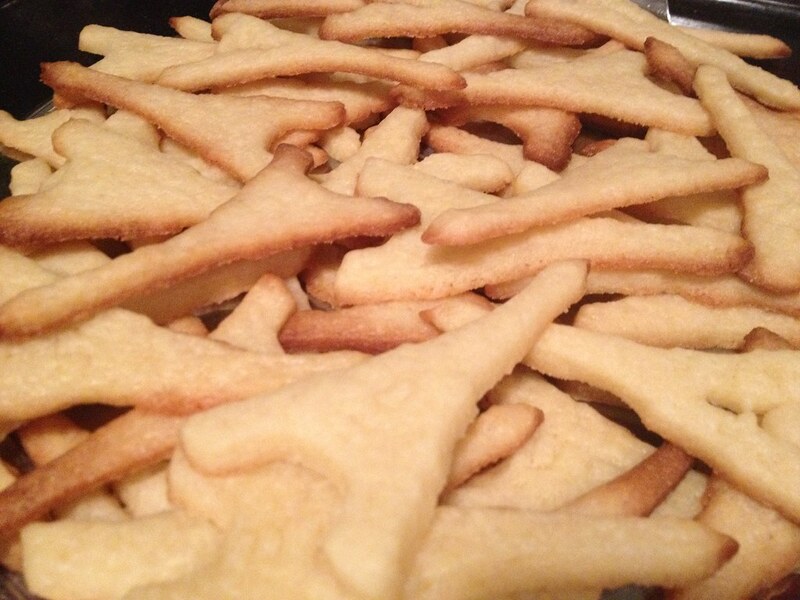 For their farewell-party I made plain Sugar Cookies with a bit of lemon taste and used Eiffel-Tower cookie cutters. I glazed some of them and sprinkled them in red, blue, whit, the colours of the french flag. Unfortunately; I have no picture of the sprinkled ones. 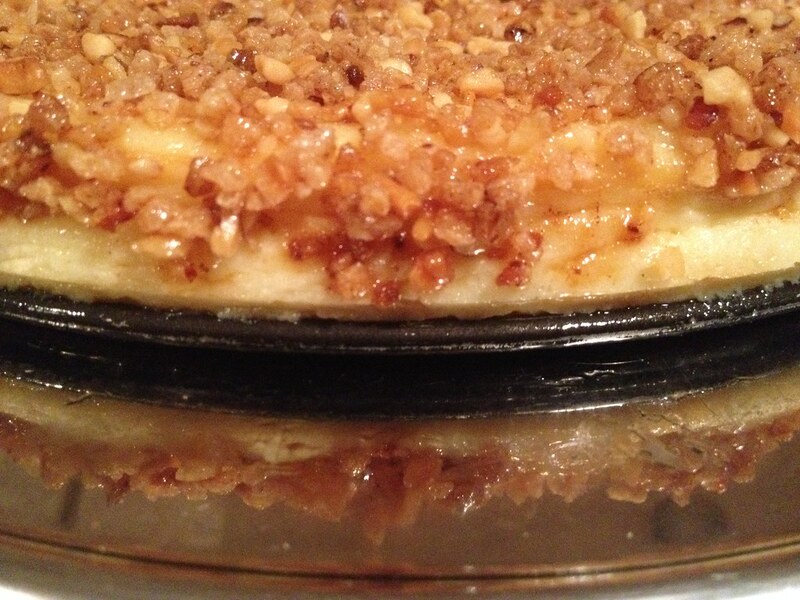 Uh, and then there was the Vanilla Hazelnut Cheesecake as a rewind. 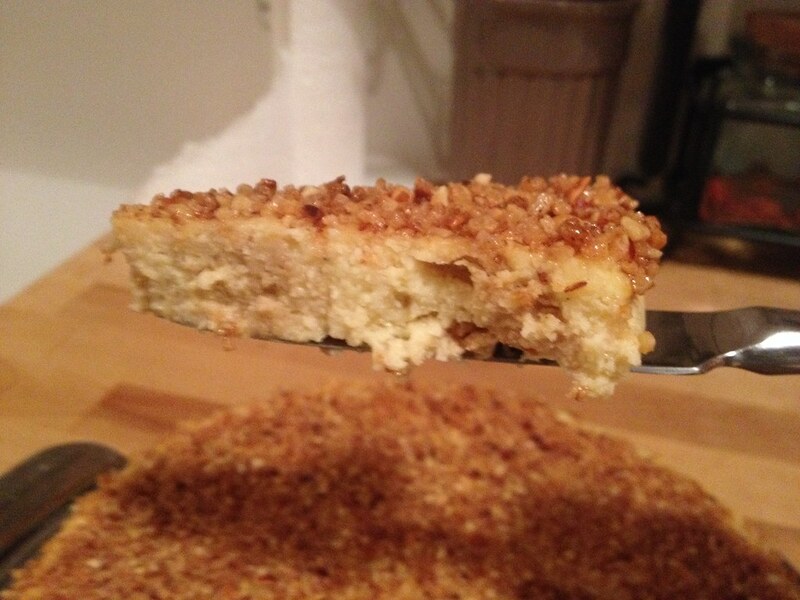 (Baking with Julia, p.) Very good. Maybe not my all-time favourite cheesecake recipe, as I prefer more cheesecakes with mostly creamcheese and not so much cottage cheese. Unfortunately I used a too big form so it went very flat. But it was very good - how can a cheesecake not be very good? Oh, that frosting on the cake looks lovely...I would love to have tasted a slice of that! I love the sounds of the seasoned sugar.....I would enjoy using that in some of my baking. I found the shaping of the rugelach to be a little tricky, but they tasted so good. That's great you mentioned the name I was thinking the very same thing. And I bet that was quite a surprise to have it turn green! Nice review of all your recipes! Black butter - that is very interesting. Going to look that up. Black butter sounds incredible! Your cake looks fabulous! Wow! You've been busy. The black butter is intriguing. sounds like it would have been delicious with your cake. I loved your story about the sugar. Holy cow! Good for you to get caught up - oh what a feeling - hey?! Though your cake is very different, it looks good!